Recently the picture of the blackhole was released and we got a mesmerizing view of something the world never saw before, Blackhole. The world went crazy after the image release, memes, videos, blogs, and articles were all over the internet but why am I telling you this? Because It was not just memes, articles and videos. 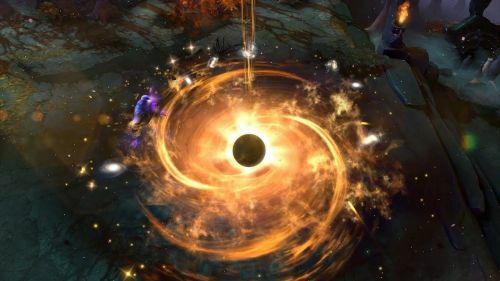 Dota2 players found their own unique way of sharing their excitement - by creating black holes in their games. How? By picking Enigma. Enigma is a Dota2 hero who can create Blackholes and trap enemies, make them unable to move and take damage. Players started picking Enigma right after the news was spread. In fact, Enigma's pick rate and win rate grew quiet higher than it used to be. Now we know heroes go through these phases but that normally happens when a new update is released. Patch changes can make a hero popular and infamous. But this is the first time a Dota2 hero is gaining pick rate and win rate rapidly and it has nothing to do with any in-game update. The weird part is, according to Dotabuff, Enigma not only gained a huge pick rate but he gained a lot of win rate as well. What is the mystery behind that? A patch change explains how a hero gets better but without any change why the sudden rise in the win rate. Considering if all the pickers are picking out of excitement, a lot of them have not played the hero a lot, which should drop his win rate. There can be two reasons. The first one is very simple, most of the players who are picking Enigma these days already had the hero in their hero-pool. Which means a lot of people who had Enigma in their hero pool was not playing the hero and now they are? Or it can be the mysterious reason #2. Maybe it's the Universe giving us a sign? Well, you can think about what you want to and make an explanation for yourself but I will better not mess with the Universe.